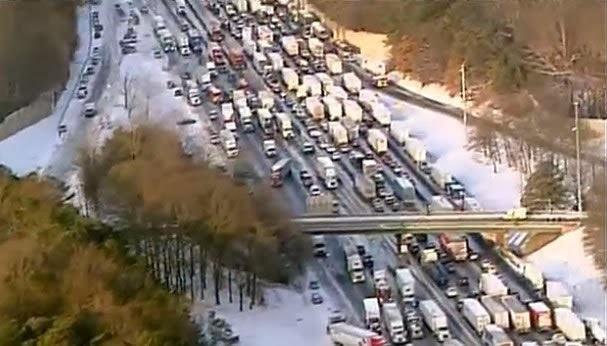 By now many people will have heard of the snow in Atlanta this week, which brought the city to a messy standstill. My sympathies to anyone caught up in it. The main problem by various accounts was that none of the authorities took action in advance of the storm. I say a storm, but I gather it was only a couple of inches of snow, which melted then froze on the roads - making driving a tad tricky for people not prepared for iced roads. It appears that what happened was that ahead of the event, there were no requests for people to stay home. When the storm hit, lots of people tried to go home and got stranded on the roads. Children were stranded at school overnight. Road maintenance people couldn't get onto the roads to salt them or whatever they might have done if they didn't have salt handy, because they were gridlocked with cars. The end result was general chaos plus a bit of the blame game. Does anyone recall the pre-emptive closing of federal offices in Washington DC last April, owing to a forecast of snow? I remember this, since I was in DC for congressional testimony (a tweet at 2 a.m. told me the Hearing was cancelled). Well, it rained in DC (didn’t snow). A bunch of flights into and out of DC were cancelled (including mine), but other than that I think the consequences of this pre-emptive closing were pretty minor, and that the right call was made by the government officials. Another example with a more complex outcome was the evacuation of Houston in 2005 in anticipation of Hurricane Rita. Following on the heels of Hurricane Katrina, sensitivity was high. Rita weakened and turned north, having almost no impact on Houston. Several people died in evacuation traffic accidents. My argument is that the level of uncertainty is too great for a pdf of climate outcomes to be useful in the context of the precautionary principle. Combine that with what a two degree or hotter world will be like and it makes a lot of sense to reduce emissions. Since the longer we leave it the bigger the cut will need to be, it also makes sense to start switching in earnest sooner rather than later. At least to create an environment that encourages the shift to clean energy. At the very least to remove barriers to shifting to clean energy. On the HotWhopper scale of no cert to dead cert, the dead cert of bad things happening if we don't cut CO2 emissions is a far surer bet than the chance of a snow storm in Atlanta. Thing is, I expect a lot of people find it more pleasant to take a day or two off work (providing they still get paid) than finding out that their electricity comes from geothermal power or wind power or solar power. The latter notion makes some people go bananas. "What?" they shriek. "You mean this electricity didn't come from black-lunged paupers taking the tops off mountains?" They cry. "It's a travesty! What is the world coming to!" Exploring the mind of a climate science denier is fruitless. Nut-full and fruitless. PS From now on I'll be allowed to do what I've been doing - cite the IPCC report and quote from it. The final version is up on the website. 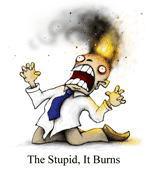 H/t Stoat - who has been having fun trawling through the comments to it and the IPCC responses. Collin Maesson at realsceptic.com has written a couple of articles about the value, or lack thereof, of using Alexa rankings to monitor blog popularity. You can read them here and here. Since Collin is in the business of software development, he knows about such things as statistical monitoring and web page ranking services and about how best to monitor readership. Knowing something about readership is important if you care about your readers. If you know your blog is losing readership, you can do something about it (if you care). Recently HotWhopper's Alexa rankings began to drop off from a low of around 382,000 late last year (lower is better) to the current 1,003,243 (as at Feb 4 2014) - which is where it was back in the first week of July last year. Thing is, back in June last year, HotWhopper was only six months old and, according to Google Analytics got 29,358 page views for the month. In January this year it got 59,800 or double June's page views. So it seems rather strange that HotWhopper's Alexa ranking went down so much while its page views doubled. Collin noticed the improvement in Alexa ratings of his own blog and was curious as to why HotWhopper appeared to be dropping in popularity. He asked if I'd allow him to analyse our stats, which I was more than happy for him to do. He wrote the results up on his blog here. After Collin approached me I did a Google search and came across this article, which had almost identical results. ...It’s probably because I’ve written about Alexa a couple of times and I have a high ranking for my Alexa content in Google searches. My website is often displayed on the first page in Google, I can see that with the statistics I have in Google Webmaster Tools. What you need to realize about this is that people who search for information about Alexa rankings tend to be Alexa users, which means that there’s a good chance that they also have the Alexa toolbar installed. So this article is a little experiment. It's about Alexa, so it might pop up in web searches for Alexa or Alexa ratings or Alexa toolbar or Alexa popularity. If it does then maybe, as Collin surmises, HotWhopper will get a few visits from people who have the Alexa toolbar installed. If that's the case, then HotWhopper's ranking on Alexa should rise. We'll see. PS I'm burying this by pre-dating it by a few days, so most normal HotWhopper readers probably won't see it. It's just an experiment after all. Anthony Watts is running out of material again. He's been working his way through the denier memes at SkepticalScience.com. His latest is "the climate's always changing" or, as is currently Number One on the SkepticalScience.com list of "Most Used Climate Myths" - "Climate's changed before". Anthony thinks he's on a winner because he knows one thing about his unruly mob of science deniers, they don't just reject the science, most of them are also extreme right-wingers who really don't like President Obama. Anthony's argument is that because, more than a century ago, Lord Kelvin underestimated how much more there was to learn about particle physics, then there's a big chance that the greenhouse effect isn't real today - or some such silliness. I've already written about his recent blog article on the denier meme "it's not bad", which Wondering Willis wrote (currently No. 3); and the recent blog article on the denier meme "it's just a trace gas" which Ryan Scott Welch wrote (currenly No. 75) - both in just the last couple of days. Recycling denier memes from the SkepticalScience.com list. Given how much Anthony dislikes SkepticalScience.com, he must be really hard up! It is very difficult for POTUS right now. He is bright and knows he is right. We are all just dumb unwashed for not getting it and agreeing with him. Allow me to put this in religious context, since that is the most logical description of the warmist brethren, “Anyone, or any organisation that prophesies with faith and certainty, is by their very nature – FRAUDULENT”. I think Obama can be forgiven for his position on this. I’ll bet that if you polled the CEO’s of the Fortune 500 the majority would tell you AGW is a fact, and a serious problem that needs to be dealt with. Why do you think we are having a Super Bowl in an outdoor stadium in NJ. It’s because people thought winter was history. Wondering Willis Eschenbach has signed up to the "it's not bad" denier meme (archived here). His article has the title: Should We Be Worried? and is aimed at quelling the fears of all the scaredy cats at WUWT. To do so he decided to call up the monthly UAH charts. Now monthly charts aren't that easy to read because the noise of the seasons and general fluctuations can make it hard to see the longer term warming signal. Here is what Wondering Willis concluded from his examination of the data. I've included the same data as Willis except that I've shown the anomalies as annual averages rather than monthly averages. 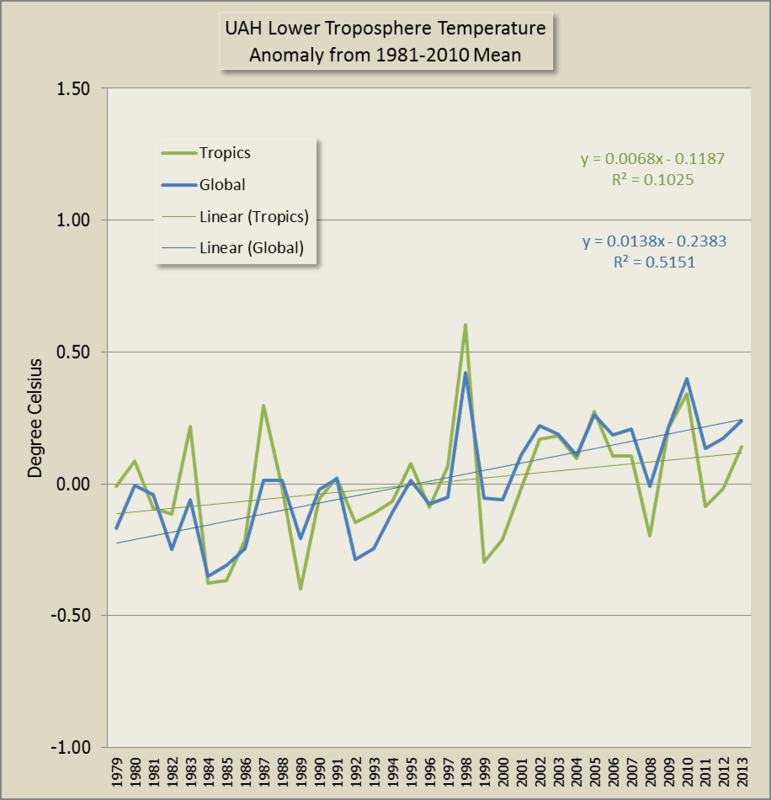 Here is a chart of UAH lower troposphere temperature in the tropics together with global lower troposphere temperature. Willis is one of those deniers who thinks that burning fossil fuels is the only way that "billions of poor people in the tropics" can produce all those goods that the wealthy people in the mid-latitudes want those "billions of poor people in the tropics" to make for them on the cheap. He is also one of those deniers who thinks the only thing that counts is surface temperature changes. 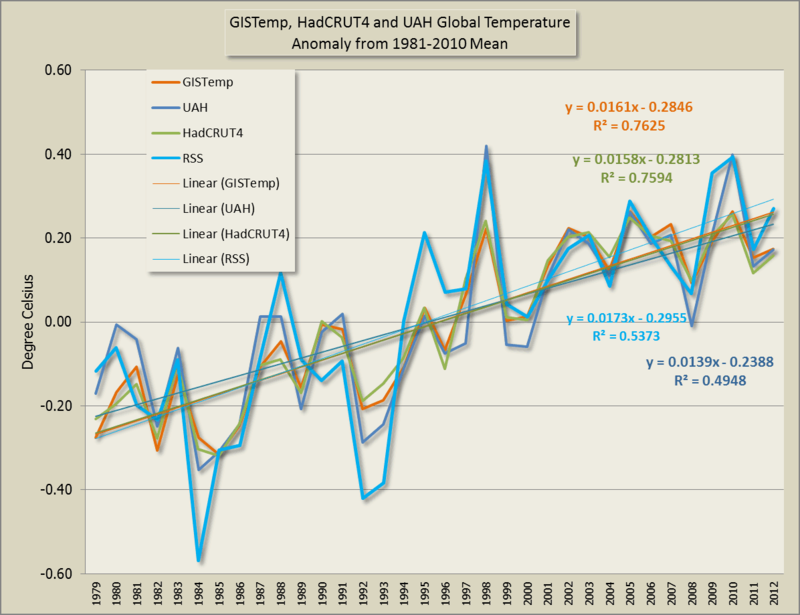 He's not far off with the trend - 0.06 degrees a decade but with a very low R squared. At most a slight warming trend over the period since 1979. 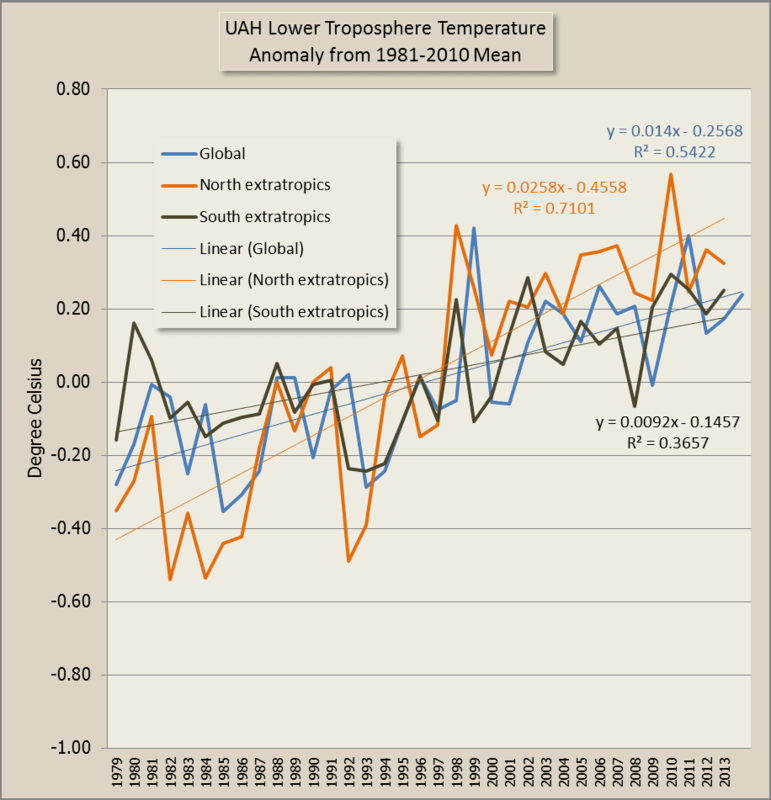 Here is a chart of UAH lower troposphere temperature in the extra tropics together with global lower troposphere temperature. Southern Extratropics? No trend....Northern Extratropics? A barely visible trend, and no trend since 2000. Barely visible? There is a marked trend in the northern extratropics (R squared = 0.71), of 0.25 degrees a decade. In the southern extratropics the trend is a less definite 0.09 degrees a decade. 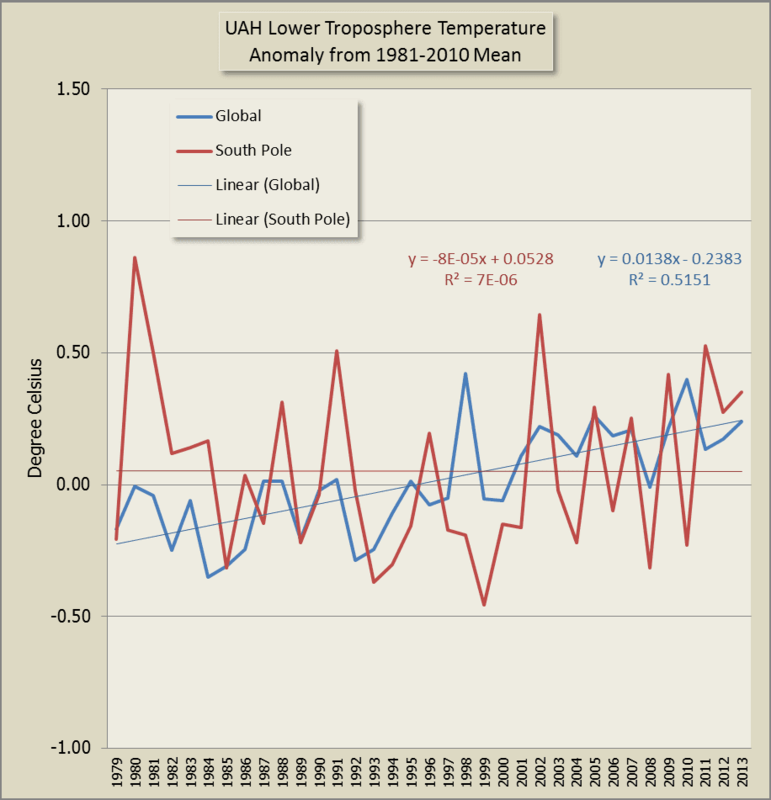 Here is a chart of what UAH calls South Pole temperature anomalies together with global lower troposphere temperature. South of the Antarctic Circle? No trend, it cooled slightly then warmed slightly back to where it started. This time he's pretty well right. I don't think I've ever noticed that remarkable temperature anomaly in 1980, which was 0.86 above the 1981-2010 average. Now that's an anomaly if ever there was one. Addendum: There may be inaccuracies in the lower troposphere readings at high latitudes - see this paper by Richard E. Swanson - h/t Robert Grumbine in the comments. 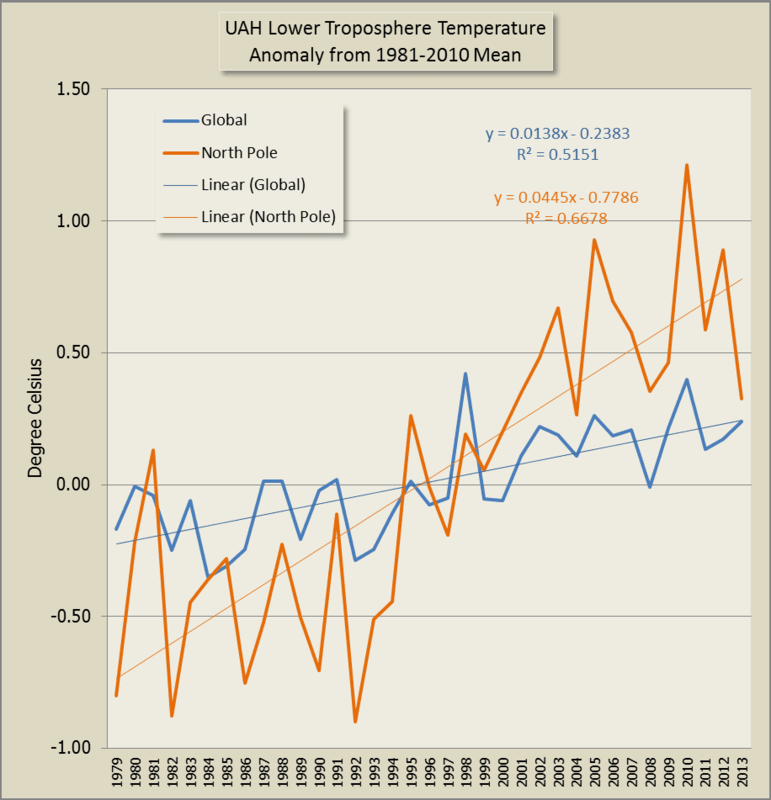 Here is a chart of what UAH calls North Pole temperature anomalies together with global lower troposphere temperature. Clearly the Arctic is where there has been most warming of the lower troposphere. 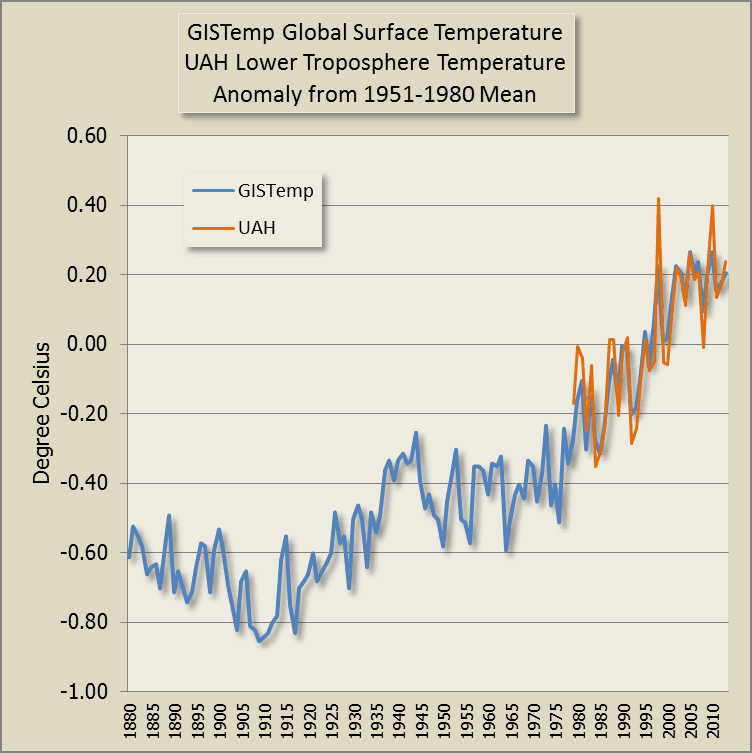 The trend is 0.45 degrees a decade. That's huge by any measure. 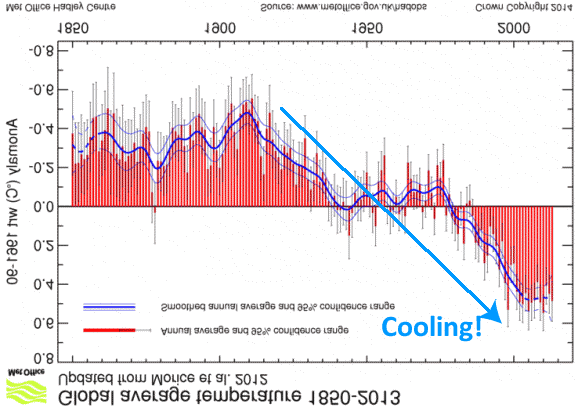 And I wouldn't call the 2010 anomaly of 1.21 degrees above the 1981-2010 average as "staying even", would you? My conclusion? I don’t see anything at all that is worrisome there. To me the surprising thing once again is the amazing stability of the planet’s temperature. A third of a century, and the temperature of the tropics hasn’t budged even the width of a hairline. That is an extremely stable system. I explain that as being the result of the thermoregulatory effect of emergent climate phenomena … you have a better explanation? What data does Willis ignore? All the temperature records prior to 1979, dating back to 1880 and before. For example the land and ocean surface temperature anomalies. 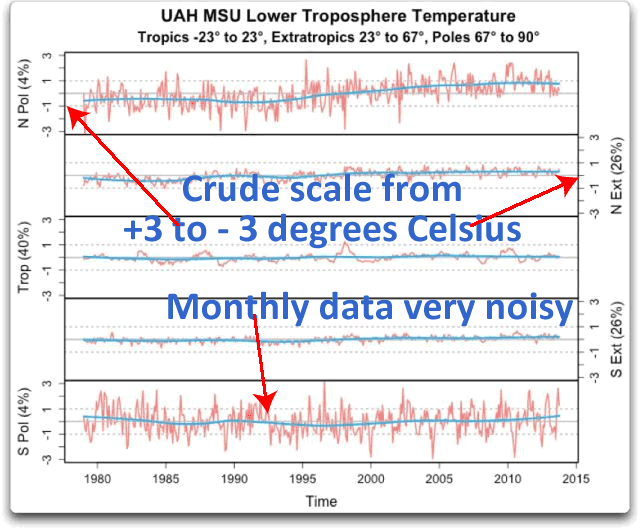 The chart below shows UAH and GISTemp anomalies. The surface temperature has gone up by one degree since the lows of the early twentieth century and by 0.8 degrees since 1880. The lower troposphere has pretty well tracked the surface temperature, spanning minus 0.2 to plus 0.4, with an eyeballed rise of around 0.3 degrees since 1979. As if a change of plus or minus 3 degrees over three decades wouldn't be "catastrophic" to use a denier term! And deniers insist on using monthly data because it helps to hide the signal from prying denier eyes. You may recall that Willis rejects the long term rise in global temperatures and has on more than one occasion claimed that temperatures have been +/- 0.3 degrees over the past century or so. That's obviously not the case. 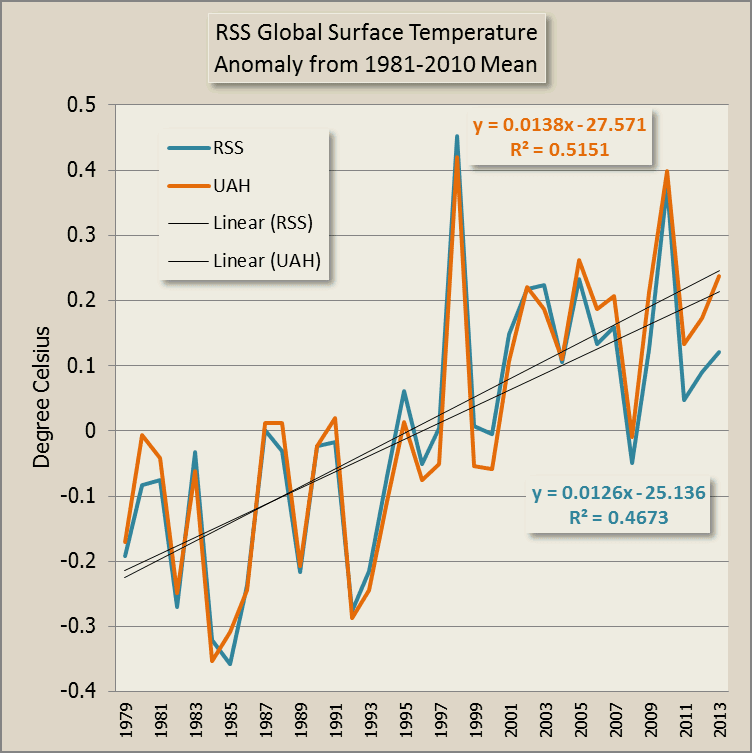 The global temperature has been going up, up, up much more than 0.3 degrees Celsius. Willis asks for a "better explanation" than his "emergent climate phenomena". How about the greenhouse effect! That's the mainstream view of what is happening. With more and more CO2 the temperature goes up. This results in various feedback mechanisms coming into play, such as more water evaporating so even more greenhouse gases causing Earth to warm up, and ice melt plus less spring snow cover so less reflected sunlight meaning more energy accumulating for longer. There aren't that many comments so far. Here's a sample (archived here). My answer to your question: No – and best now to ditch the surface thermometers entirely (with all their problems), and rely on the satellites instead for accurate measurement. But shouldn’t it have been “What me worry”? …! JK – I’d love to see how the “experts” turn this into warming with their gridding of the Earth. Is there some trick that makes warming like Mann made hocky sticks from red noise? What happens if you merely sum those 5 graphs with proper areas weighting? Why is there such a difference between UAH and RSS ? A couple of years ago Roy Spencer speculated that the recent discrepancy between UAH and RSS may be in part because RSS is using an older satellite and may not be applying the correct correction for diurnal cycle drift. Or it could be just the different coverage of the globe. If anyone else knows more about this, please let us know. Addendum: I'll repeat here - there may be inaccuracies in the lower troposphere readings at high latitudes - see this paper by Richard E. Swanson - h/t Robert Grumbine in the comments. “Emergent phenomenon” is an argument from incompetent, third-rate thinkers like Richard Dawkins, determined to push Darwinian, or undirected, evolution upon students of science, despite its by now obvious failings; back in the 1980′s, it was called “order out of chaos”, elevated to the airy status of a “meme”, and “chaos theory” was misapplied to support it (for the latter really only supports “order behind the apparent chaos”, not order produced–”surprisingly”, as Eschenbach himself emphasizes–BY chaos, or randomly-working physical processes). But the idea fails, and fails here on a very basic level. “Emergent phenomenon” does not “explain” the “extremely stable system”–and the outstanding stability SHOULD be emphasized, as I have also done–it cannot, it is in fact logically opposed to it (“emergent phenomenon” is change, as Eschenbach’s examples well show, while “extreme stability” MEANS unchanging). “Emergent phenomenon” is a desperate renaming of the observable truth, in order to avoid that truth. It is anti-scientific nonsense, which science will have to reject before real progress can be made. It is, in short, the same as saying “magic”, which science once so proudly scorned, and by which it lifted itself up out of the ancient pit of superstition and “sacred writ”. Here's an archive of Harry's blog. Justthefactswuwt is back with some satire - at least that's what it looks like to the casual reader (archived here). There's the schematic from FAR that Fred Singer abused recently, with no numbers on the temperature scale and no indication of what data it is based upon. In fact there is no description given at all at WUWT. Here is the description - dunno how I missed it. Funny how science deniers keep yelling for "code and data" but don't ask for data when it suits them and don't even ask for numbering on the axis. As Lars Karlssen pointed out, the origin was traced by Jones et al (2009) - see Appendix A page 36. It's history goes all the way back to this paper by Lamb from 1965. It is so primitive I'm surprised that even science deniers keep resurrecting it. Here is an animation comparing the above chart as shown at WUWT with Figure 7.1 from FAR (page 202, not as cited by justthefactswuwt as page 250). I've added the current anomaly assuming the markings on the scale at the left denote one degree Celsius. The caption states the "dotted line nominally represents conditions near the beginning of the twentieth century". Temperatures are now 0.8 degrees above those "near the beginning of the twentieth century" so even on the above schematic, Earth is now approximately 0.2 degrees hotter than the highest temperature in the schematic. By the way, the sentence in FAR that references the chart is as follows (my bold italics). 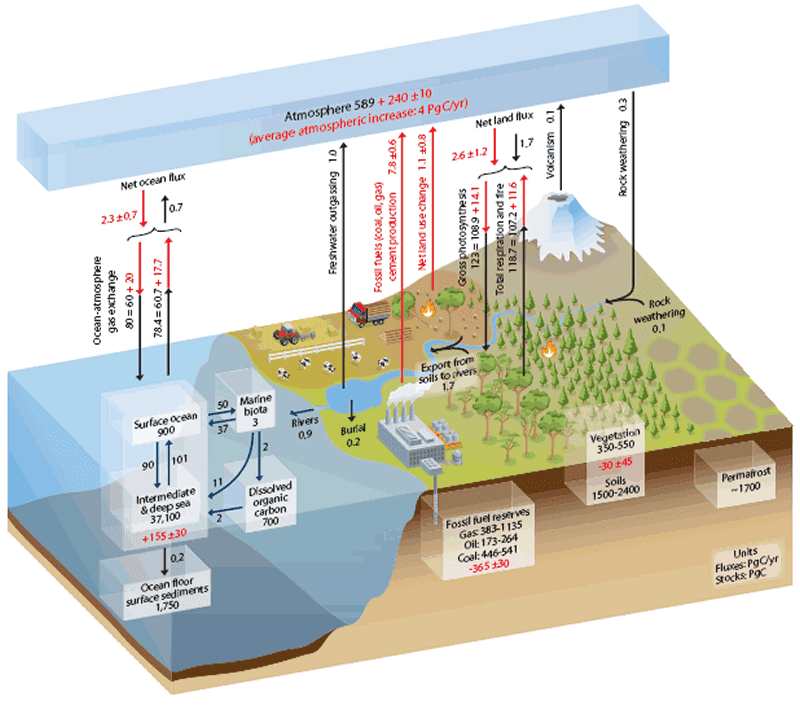 The period since the end of the last glaciation has been characterized by small changes in global average temperature with a range of probably less than 2°C (Figure 7 1), though it is still not clear whether all the fluctuations indicated were truly global. Compare it with this latest set of reconstructions by lots of different independent teams using lots of proxies from all around the world. The other bit of satire, or I presume it's satire, is when justthefactswuwt puts up this chart and directly underneath it writes: In fact it was not until approximately 1975 that temperatures began to rise. As such, one could argue that Global Warming began in approximately 1975. Apparently if the anomaly is below the baseline it doesn't count with WUWT! There's more nuttery at the WUWTery - but that's all I have time for. Anthony, this should be published in every major newspaper in the world as a paid full page advertisement (possibly excluding the first paragraph). I would be happy to make a contribution to this. What a truly excellent article, thank you! It just goes to show how wide-of-the-mark and intellectually moribund those who deploy the ‘denier’ insult actually are. They are lower than a snake’s belly in a gutter. And that’s before you even take into account their unwitting invocation of Godwin’s Law, by attempting to smear those who are sceptical of the CAGW conjecture as having Holocaust denial tendencies. Providing you accept the veracity of the data used to create the above graphs, there is no doubt that the CAGW conjecture is pure bunkum. The jig is up, and the hoax is finally over. From the opportunist headlines department, and the department of Vinerisms “children just won’t know what snow is” comes this press release. Apparently Winter Olympics will be a thing of the past. Only six of the previous Winter Olympics host cities will be cold enough to reliably host the Games by the end of this century if global warming projections prove accurate, a new Waterloo study has found. 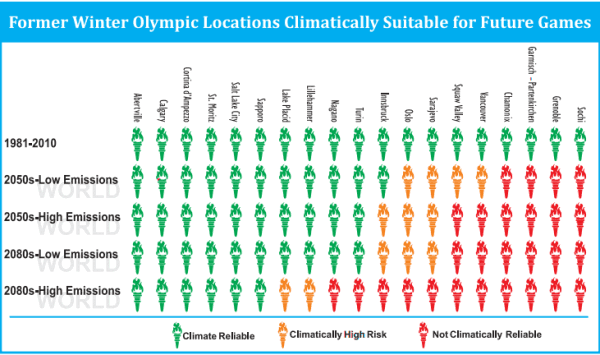 Even with conservative climate projections, only 11 of the previous 19 sites could host the Games in the coming decades, according to the study conducted by the University of Waterloo and the Management Center Innsbruck in Austria. Here are a couple of charts I've animated from Berkeley Earth, showing the temperature rise in Sochi and Krasnodar (the region around Sochi), where the current Olympics are to be held, and Vancouver, where the last winter Olympics were held. The Accuweather forecast is looking a bit iffy, too. It's just had a nice dump of snow but it may not last. The weather leading up the Olympics is expected to turn milder which could lead to deteriorating conditions on the slopes used for the Olympic Games. Whether or not the weather pattern will lead to problems for the Olympics will depend on how mild and how long this pattern lasts, but the concern exists nonetheless. The moguls at WUWT know a snow job when they see one (or think they do). (Sorry, couldn't help myself. Too punny?) Here is a sample from the archived article here. January 23, 2014 at 9:12 amGawd help us to survive these lunatic claims. January 23, 2014 at 9:26 amThis is rank alarmism and in fact is deliberate propaganda. Goebbels would recognize the technique. It won’t do them any good- it is the coldest winter evah and people are praying for warmth. Also, the day of climate alarmism has passed and people are either chuckling or yawning at this type of hype. Oh brother! Sochi has humid subtropical climate, and the last winter olympics in Vancouver, Canada is a city with a west coast marine climate (meaning a warm temperate climate where the mean monthly temperature all year round is well above freezing), perhaps the Olympic committee should choose better spots to hold the WINTER Olympics. For pete’s sake, it should be basic that the location of the “winter” Olympics should at least actually have a winter. No? The future of winter olympics in a warmer world, by Daniel Scott, Robert Steiger, Michelle Rutty and Peter Johnson.